I have to declare an interest. My grandfather, the painter Duncan Grant, was the nephew of Lady Strachey and first cousin to Lytton and his siblings. I am related to a good many of the characters in this book: Vanessa Bell was my grandmother, Frances Partridge my mother-in-law, and David Garnett my father. 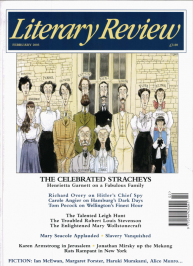 I knew Julia Strachey well, and Oliver, James and Alix Strachey were some of the familiar faces of my childhood. If this sounds complicated, it was perfectly ordinary to me, for I had never known anything else. Growing up in the Fifties of the last century (when the Leavises reigned at Cambridge with the authority of lvan the Terrible and Catherine the Great rolled into one), I never knew that Bloomsbury was anything but a beautiful if somewhat drab district of London between Tottenham Court Road and King’s Cross where my spindly Strachey relations lived in a tall house in Gordon Square. Occasionally, my grandparents, who had a charming but shabby little flat in Percy Street as a London pied-à-terre, would take me to drink strong Darjeeling tea with Pippa, Pernel and Dorothy Strachey, old ladies with brittle bones, cracky, high-pitched voices and a particular way of asking one corkscrew questions which assured me that they were genuinely interested in the business of living. I took this for granted. Everyone else I knew had relations, and it didn’t strike me at the time that mine were any odder than anyone else’s. I was wrong. The Stracheys were very peculiar indeed.